Unique and creative landscape design and installation is our core business. We have superior plant knowledge and experience to help customers see their landscape ideas "grow". We take pride in giving each customer individual attention. We spend time and give care to each and every project. 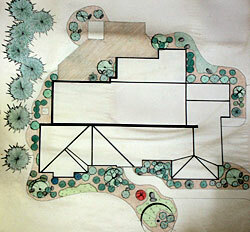 Input such as photographs, measurements, and homeowner ideas help in the landscape creation. Once the design is finished, we present the design to the customer at our office and nursery. It is presented in a 2D ‘birds eye view, along with either a 3D visual printout to help the customer visualize the look, or with a selection of the plants displayed together in the nursery.